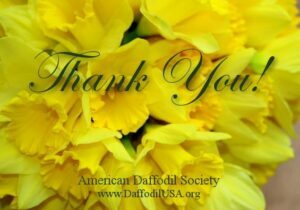 Murray Evans became interested in hybridizing daffodils after a visit to Grant Mitsch’s fields in Canby, Oregon, in the 1950s. He registered his first hybrids in 1965, and issued his first catalog list in 1969. After his death in 1989, Bill Tribe and his wife Diane (Murray’s niece) continued the business under their name–Oregon Trail Daffodils.